To me it seems like the game is inspired by Angry Birds, but the humour is alot better. It’s simple, mindless fun with a few neat features thrown in. As you can imagine, the game should have a funny and unique art style, luckily it does. You can see this in the screenshots or the intro video from the first part of the official trailer. Every type of object or person will perform a different animation when hit by the poo missiles of death, and Creative Undead implemented a great foreground/background system. The game also features artwork by local Australian animators and artists including Francis Stanton (all in-game art) and the intro animation sequence is by John Grist with the assistance of Michael Harris, the music and sound FX are by Liam Hill and programming was handled by Alex Anguix, co-director of Creative Undead. It’s all quite charming and makes you forget the ridiculous concept this game is attempting, but somehow pulls off. 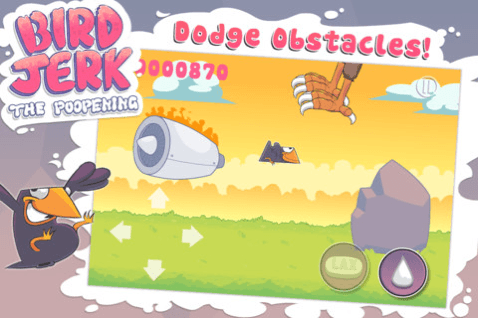 The controls for Bird Jerk are simple, just like the concept. 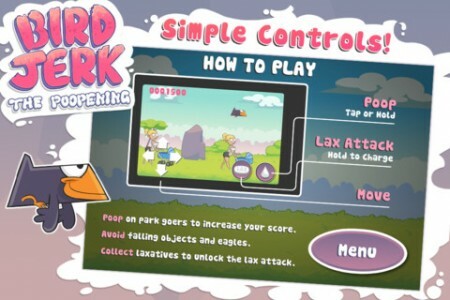 There is a D-pad is on the left side of the screen to move around, and the poop/LAX button are on the right. You currently can’t customise any of this, but that’s okay because it’s not necessary. Although I did find the virtual D-pad to be abit sensitive for my liking, and the game can be a little slow, that’s the only gripes I had with the overall experience. The aim of the game is poo on as many things/people as possible, build your score and avoid the obstacles that come from above (like eagles, anvils etc). The levels change at timed intervals, making the game feel randomized to a degree, which is a good thing. Every level had a different theme, I don’t think I actually went through the same level twice, and that’s nice as it adds some replay value to an otherwise simple game. The LAX power-ups scattered through the levels also add power to your ring of fire, spitting out three shots instead of one, if you hold down the LAX button it adds to the number of shots fired up to a total of eight. Imagine actually shitting eight times, let alone a bird, does that happen? That’s crazy! Hopefully in future more features are added to the gameplay, cause right now you could argue it’s too simple, which may not hold your attention for too long. The achievements are nice, but having only 6 doesn’t really add much incentive, I know I didn’t bother to get every single one. You may feel differently and have more determination to poop on everyone. Good on ya if that’s the case!